The Chord of the Day was Gbmaj7. Within a couple of years, I purchased a cheaper backup guitar. It was an Epiphone Special II , which didn't quite play as well above the 12th fret. I didn't quite like that the output jack is on the side of the guitar, whereas my Strat's output jack is on the face of the guitar's body. I always feel a bit paranoid to lug around a guitar with an angled headstock in a gig bag ; you're better off with a hardshell case for most Epiphones and Gibsons (the parent company of Epiphone). 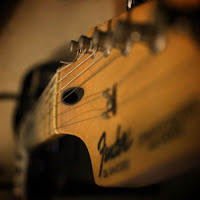 However, my fretting hand loved the Gibson scale length of the neck, as opposed to the longer scale length in most Fenders, including my Strat. For example, string bending feels easier on a Gibson-scale guitar versus a more tense, Fender-scale guitar. Fast forward a couple of decades, a couple of years ago, I had the opportunity for find a nearly-perfect fit for the criteria I've been developing over the years. The Fender Cyclone (or more inexpensive Squier Cyclone, which I purchased), is shaped like a Fender Mustang . Now the Mustang has a very short scale, shorter than the usual Gibson scale guitar. The Cyclone has the exact scale length as a typical Gibson. Additionally, the output jack is on the face of the guitar, and the straight Fender headstock is ideal for lugging around in a gig bag. It is nearly a perfect electric guitar; I just wish that the neck radius felt as "flat" or "shallow" or had the same exact feel as my Epiphone -- but it's good enough. I wonder if I could find a guitar with the same specs as my Cyclone, but with more expensive wood and "better" hardware and electronics. The search continues in the background, but I'm very happy with my Cyclone. 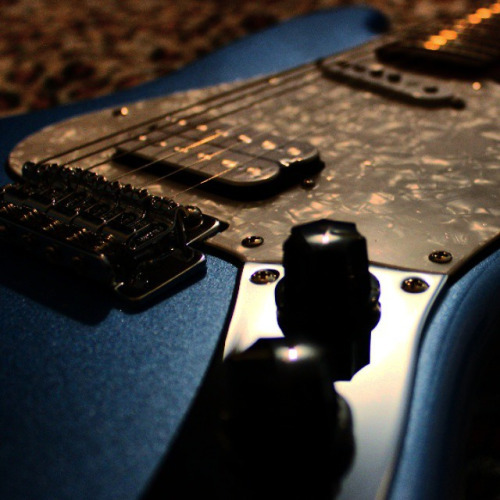 The "lesson" in this blog post: No matter what instrument you play, you should always know what you want in that instrument, especially when your preferences change over the years. Cheers, and keep jamming!